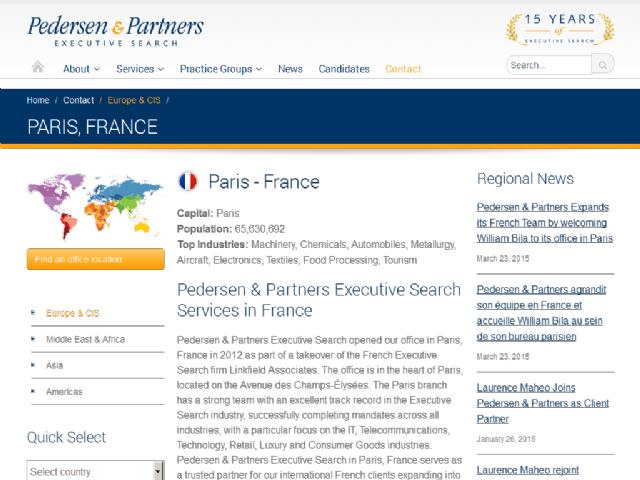 Pedersen & Partners Executive Search opened our office in Paris, France in 2012 as part of a takeover of the French Executive Search firm Linkfield Associates. The office is in the heart of Paris, located on the Avenue des Champs-Élysées. The Paris branch has a strong team with an excellent track record in the Executive Search industry, successfully completing mandates across all industries, with a particular focus on the IT, Telecommunications, Technology, Retail, Luxury and Consumer Goods industries. Pedersen & Partners Executive Search in Paris, France serves as a trusted partner for our international French clients expanding into emerging markets, and for our clients in emerging markets with intentions of developing their business in France and other French speaking markets.